The Game of Life Game - Download and Play Free Version! The Game of Life board game has been a cult classic for the family for decades, and now it's better than ever! Play single player or challenge up to five of your friends; it's up to you! In classic mode, the game plays out just like the traditional board game. Cards are static and are collected as players move around on the board. However, in enhanced mode players must work to earn their cards by successfully completing minigames and activities. This makes the PC version of the Game of Life even more interactive and action packed than the original, all without losing the essence of the original game. 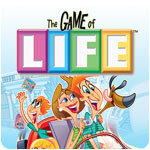 The Game of Life supports up to 6 players at a time, making it an excellent family or party game. One or two players can have all the fun of playing with a full house by selecting computer players of varying skill levels, making the game more competitive if desired. 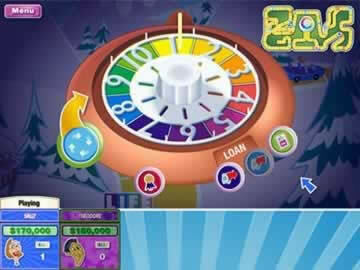 At the start of the game, each player is given $10,000 to start out with and an option to either start their career immediately or pull out a loan to go to college. College careers typically pay more in the long term than other careers, but the debt accumulated in acquiring one is steep. Spending all the money for a college education only to be laid off is one of the risks in this game, just like real life. As players continue along the board, life happens in the form of taxes, accidents, volunteer opportunities and more. Eventually players buy a home, get married and decide whether or not they want to have children. Just like in real life, everything has its pros and cons. In addition to the curveballs life throws, your fellow players are something to watch out for as well. Beware the occasional lawsuit or the Share the Wealth card! The player who retires with the most funds wins the game. When you choose enhanced mode, the game becomes much more interactive. Instead of simply winning the lottery, you will get to scratch off your ticket to determine your prize. If another player files a lawsuit against you, a court minigame will determine the winner in your case. The Game of Life PC is the next evolution of this classic board game. With bright, clear graphics and pleasing sound, it's everything you love about the Game of Life without the time consuming setup and putting away of the board and pieces. Just sit down with the whole family and enjoy!